In a large bowl, thoroughly mix ground beef, onion, salt, pepper and garlic powder. Mix in bread, milk, egg, 2 tablespoons mustard and 1/4 cup ketchup. Press the meat mixture into a 9x5 inch loaf pan. 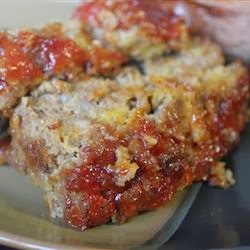 In a small bowl, stir together remaining mustard, ketchup and brown sugar; pour on top of the meat loaf. Bake in preheated oven for 2 hours.